While offering several meals just under $7, Lehmann's Landing in Earth City provides a slick sports pub with cheap grub to boot. In addition to pool and darts, the bar features live music often. 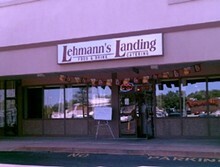 With cheap drinks and weekly specials, Lehmann's booze selection is tops with a low over-head. If you're in love with the food but not the festive atmosphere, you could try the catering services or grab your food to go. You'll be hard pressed to find a better bar in Bridgeton to catch the big game.